Comic-Con has become somewhat of a holiday in San Diego - each year, it brings with it an energy that permeates all the neighborhoods. For five days in July, downtown San Diego is transformed into one big party complete with prime people-watching opportunities and Instagrammable moments. It’s events like Comic-Con that unite the city in it’s love for comics, super heroes and entertainment, and keep loyal convention-goers coming back every year. 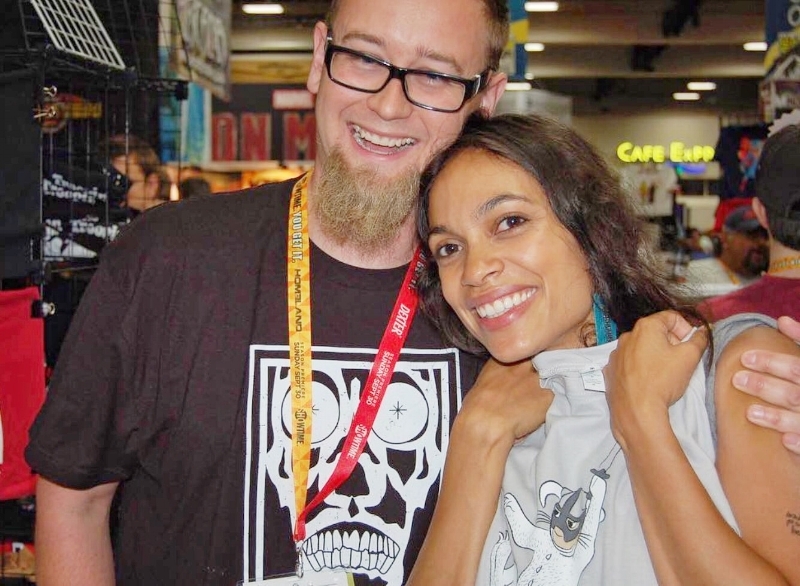 How did GraphicLab Tees initially get involved with Comic-Con? I spent several years as managing editor at Antarctic Press comics, and while there, I also coordinated the San Diego Comic-Con show for them. Once I left Antarctic Press, I continued coordinating the show for them every year for the past 15 years. Nine years ago, I was working for another company when I met Colin Wickersheim and Rob Jones. Colin kept asking me for art help and he repeatedly tried to pay me for that help but instead I refused and “banked" the favors. That December, I came up with this funny monkey design that I wanted to print with the intent of selling the shirts for a little extra money. Colin agreed to print my design and even gave me some extra black shirts he had lying around for free. I held onto those shirts until the following summer when I would be setting up the Antarctic Press booth. I took my 24 monkey shirts and asked if they would sell them for me, and they were gone within about 45 minutes. A week or so after Comic-Con, I told Rob Jones how the monkey shirts sold out instantly and without a second of hesitation, he said he felt that this could potentially be a business. After some convincing, I agreed and we started GraphicLabTees.com. That next year, I asked Antarctic Press if we could use 6 feet of table space at the booth and they agreed to let Rob and I set up our first GraphicLab Tees display at Comic-Con. With a core of six designs I created, and three from friends, we had our nine O.G. designs that we still have hanging in the office to this day. We sold out of almost everything and realized we were really onto something. Each consecutive year, we got more and more space at the booth until we eventually took over an entire half of the 20- foot space shared with Antarctic Press and became the official shirt printer for Antarctic Press. In between San Diego Comic Cons, we partnered with Colin and his print business, Textile 2000, and incorporated into GraphicLab, Inc. and became a promotional products provider for hundreds of corporations, companies and individuals. How many designs will you feature this year? We sold nine designs our first year and this year we are looking at offering close to 30.
Who comes up with all the new designs? Which t-shirts have been the most popular? Design creation is a mixed-bag - it’s either me doing it, an idea from Jones or friends and other artists that submit to us for the website or shows. Any cool celebrities or memorable people you've met over the years? Most notable celeb would have to be Greg Nicotero, Hollywood creature and effects creator and executive producer of The Walking Dead. Other celebs we’ve met are Ray Park (Star Wars’ Darth Maul), most of half the cast of Firefly, character actor Keith David, Meg Foster, Joey Pantoliano (The Matrix, The Sopranos), Rosario Dawson, and Felicia Day. Can you give us any hints about the types of designs/t-shirts we'll see at this year's booth? Parodies based on some of your favorite nerdy franchises and games. How has your involvement in Comic-Con impacted both the t-shirt and promotional products side of your business? It has seriously raised our street cred with a lot of cool companies here in San Diego and has given us a big platform to show off what we do best. Comic-Con is right around the corner and a full list of event and exhibits can be found on the convention’s official website: https://www.comic-con.org/cci.